Unlike the honey bee that is fast and active, the bumble bee is a slow and gentle bee. It hardly attacks humans and never swarms on a victim. As for bee stings, only the queen bee and its worker bees have a sting and unlike the honey bee that dies when it uses its stings, the bumble bee does not. The shape of the bumble bee is also distinct from other bees,it is round and furry. They have black and yellow bands although some species have orange or red bands, or may be entirely black. Bumble bees do not live in a hive, they build a nest cavity or live in tunnels in the ground made by other animals. Bumble bees are not as aggressive as honey bees. They usually ignore people or animals unless actively provoked. They also live on nectar from flowers and produce honey but their honey production is not enough for commercial or harvesting purposes. Scientists from Queen Mary, University of London have tracked bumblebees for the first time to see how they select the optimal route to collect nectar from multiple flowers and return to their nest. In a paper published in PLOS Biology today (18 September), the scientists, working with the Harmonic Radar Group at Rothamsted Research, were able to use radar tracking to show how bumblebees discover flowers, learn their location and use trial and error to find the most efficient route between flowers over large distances. Professor Lars Chittka and Dr Mathieu Lihoreau from Queen Mary's School of Biological and Chemical Sciences and colleagues set up five artificial flowers in a 1km diameter field. Each flower was fitted with motion-triggered webcams and had landing platforms with drops of sucrose in the middle*. "Using mathematical models, we dissected bees' learning process and identified how they may decipher this optimal solution without a map. Initially, their routes were long and complex, revisiting empty flowers several times," Dr Lihoreau explained. "But, as they gained experienced, the bees gradually refined their routes through trial and error. Each time a bee tried a new route it increased its probability of re-using the new route if it was shorter than the shortest route it had tried before. Otherwise the new route was abandoned and another was tested. "After an average of 26 times each bee went foraging, which meant they tried about 20 of the 120 possible routes, they were able to select the most efficient path to visit the flowers, without computing all the possibilities." 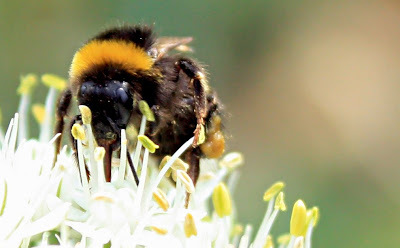 "The speed at which they learn through trial and error is quite extraordinary for bumblebees as this complex behaviour was thought to be one which only larger-brained animals were capable of," Professor Chittka said. "Interestingly, we also found that if we removed a flower, bees continued looking at that location – even if it was empty for an extended period of time. It seems bees don't easily forget a fruitful flower." "This means we can now use mathematics to inform us when bee behaviour might be affected by their environment and to assess, for example, the impact of changes in the landscape."